A staff member with Indiana-based MetroNet works to install fiber-optic cables underground. 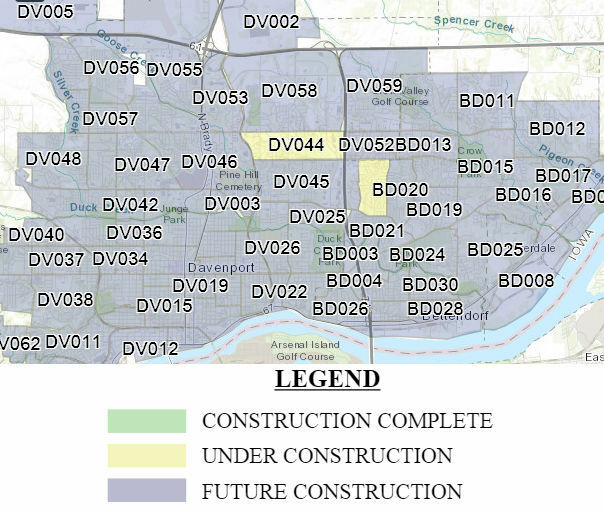 MetroNet's website includes a map showing where construction work is ongoing, completed and expected to be completed in both Davenport and Bettendorf. MetroNet will begin installing fiber-optic internet in Davenport and Bettendorf next year. An Indiana-based company bringing ultra-high-speed internet to Davenport and Bettendorf will begin construction of the fiber-optic network this week. MetroNet announced Tuesday it is beginning construction on the cities-wide fiber-optic network, to offer high-speed internet, TV and phone service. Construction will begin in limited neighborhoods but will expand in the coming weeks, according to a news release. "We are thrilled to break ground in Bettendorf and Davenport, and we’re ready to get to work bringing high-speed fiber internet to these communities," said MetroNet Executive Vice President Kevin Stelmach, in the release. "These communities have been very supportive as we work to set up the infrastructure that will be the foundation for fast, reliable fiber-optic internet." According to the company's website, construction has begun in Davenport between East 53rd and 46th streets and in Bettendorf on a stretch between Crow Creek Road and Spruce Hills Drive. Last August, aldermen in both cities approved agreements with MetroNet for the three-year build-out. MetroNet officials expect the Davenport project to cost between $33 million and $40 million, while in Bettendorf, the build-out will cost between $15 million and $20 million. Despite some private companies in the past decade entering the market to offer high speed internet, Davenport has sought to create a city-wide fiber-optic network for years. City officials once considered building a publicly owned network but said the price tag was too high. Davenport Assistant City Administrator Brandon Wright previously said city leaders realized combining efforts with Bettendorf could make the region more attractive to a new service provider. In the service agreements signed last summer, both cities offered MetroNet tax incentives. Davenport's tax breaks end after 20 years or when the refunds add up to $11.7 million. Bettendorf's tax breaks end after 20 years or when the refunds add up to $3.4 million, whichever comes first. Once completed, MetroNet will provide connection speeds as fast as one gigabit per second, allowing for heavy streaming of videos and music, more devices being connected at once, plus the ability to download an average full-length movie within a few seconds. Iowa Quad-City customers will receive communication by mail and neighborhood markers noting when crews will be installing fiber in the area, according to the release. MetroNet will provide yard signs and other notifications when the temporary construction process is beginning in each neighborhood. While the proposed fiber-optic service would reach the vast majority of Bettendorf and Davenport residents and businesses, the initial build-out territory does not include some of the less-densely populated areas. Under the agreement, the company is not obligated to provide service to neighborhoods with fewer than 25 “qualified households” within one half of a linear route mile. MetroNet also will open a retail storefront to meet customer service needs, but the location has yet to be announced. To learn more, visit www.metronetinc.com. To view a map of the construction process, visit www.metronetinc.com/construction. Quad-City Times reporter Bill Lukitsch contributed to this report.